Indochia is the area of ancient culture, especially the culture of Buddhism. However, in addition, each country has its own distinct beauty. Visiting each city of the Indochina itinerary, you will have a unique experience. Please find out what is it in the following article. Visit Ban Xanghai village, where local rice wine is made. Reach Pak Ou Caves – two famous caves in the limestone cliff, where you can see myriad Buddha images. 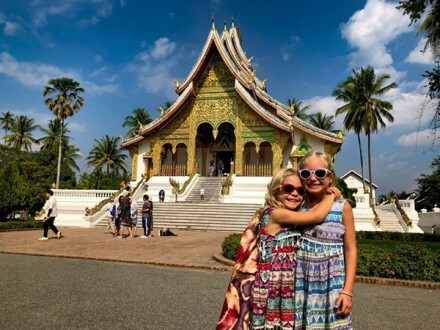 Admire magnificent Wat Xiengthong – one of the most important pagodas of Lao and remains a significant monument to the spirit of royalty, religion, and traditional architecture. 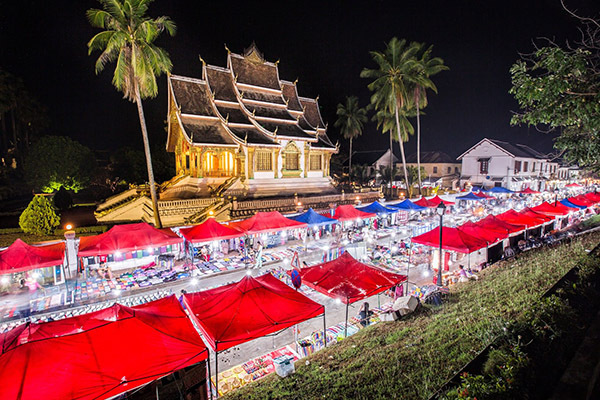 Visit the Traditional Art and Ethnology Center to learn about the cultures of Laos’ ethnic group. Stop at Wat Prabath – a peaceful place to admire the sunset, the last beauty of the day. 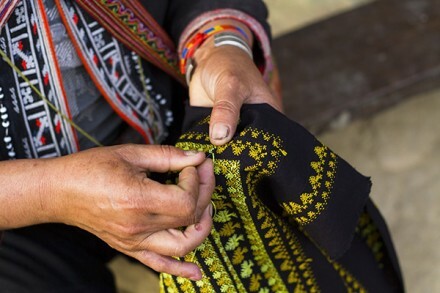 Visit Night Market, where you can see many types of handmade textiles and buy some souvenirs. Walk around the temporary morning market. Just set on the ground, the local people come here to barter their day’s catch from rice, fish, meat, chicken or vegetable. 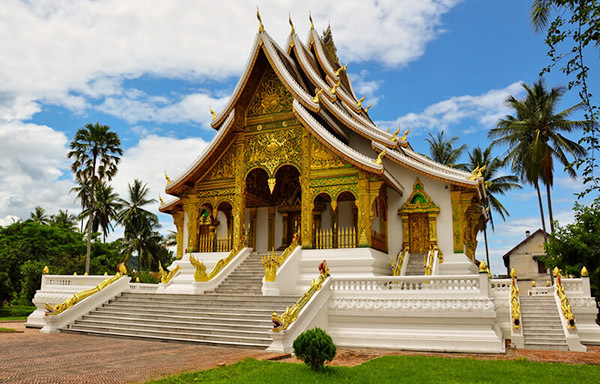 Visit Wat Visoun, the oldest temple in Luang Prabang was once home to the Prabang Buddhas. It has dating back to 1513 during the reign of King Wisunarat (Visoun). Take a rest at Kuang Si waterfalls, the most famous falls in Luang Prabang, about 29 kilometers (18 mi) south of city. Visit the Bear Rescue Center, where dozens of animals are rescued from illegal traffickers and hunters. 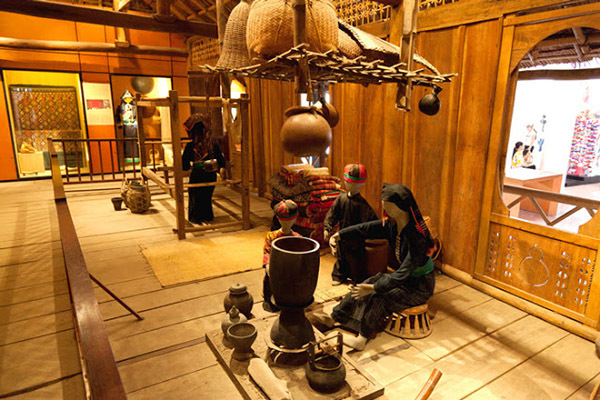 Visit The Vietnam Museum of Ethnology, which displays the stamp of 54 ethnic groups of Vietnam. Take a look at the Temple of Jade Mountain that is dedicated to the King Tran Hung Dao. It sits on a small island in the northern part of Hoan Kiem Lake. Enjoy the Water Puppet show – a traditional show of Vietnamese people in the theater. Take a tour by Cyclo around the old quarter and experience the local life of Hanoi. 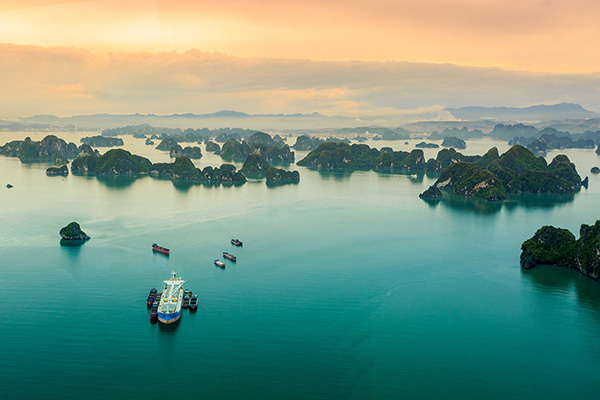 Enjoy a sumptuous lunch on the boat while cruising into the magnificent Halong Bay, admiring its thousands of extraordinarily shaped limestone islands that are considered as the heaven on the Earth. Discover Lờm Bò area – an outstanding masterpiece of Mother Nature in Ha Long Bay. Explore Mê Cung Cave – one of the most beautiful caves here. In addition, don’t forget to climb up to see the breathtaking panoramic view of the Halong Bay from above. Admire the sunset – the best moments of the day from LaFairy Sails. Experience a memorable dinner on the deck under the light of thousands of stars in the middle of the Bay, savor delicious dishes. Then, you can join squid fishing. Visit Titov Island and swimming in the emerald water. After that, hike up to the top of the island to take the panoramic view of Ha Long. 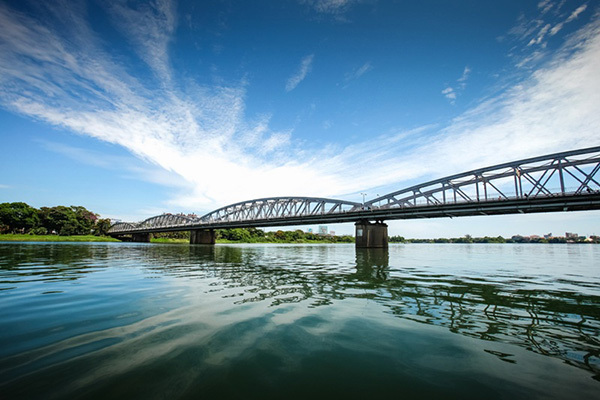 Take a leisurely boat trip along the Perfume River and visit Thien Mu Pagoda – a famous landmark of Vietnam. Visit the tombs of Nguyen emperors in a valley to explore their unique architecture and understand more about the royal life. Go to Dong Ba market to know about the life of local peoples here. 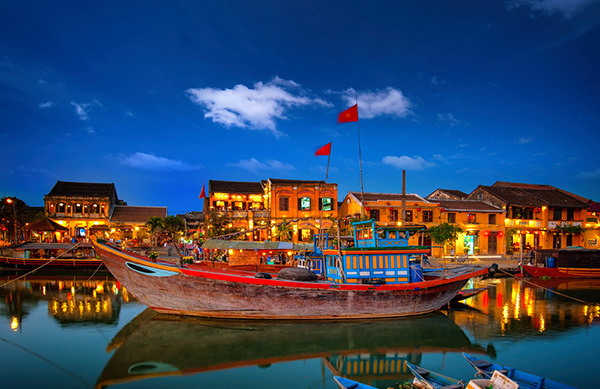 Leaving Hue, Hoi An welcomes you in your Indochina itinerary with river town, crammed with historic homes, tiny museums, cafes, and bustling silk and fish markets. 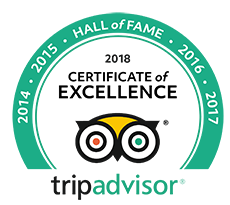 This UNESCO-designated World Heritage site has many exciting things for you to explore. Admire wonderful scenery on the way from Hue to Hoi An: Hai Van pass, Lang Co beach, Marble mountain. Visit Japanese Covered bridge, an invaluable property and officially be the symbol of Hoi An. Visit wonderful Fukian Hall, representing the Chinese architecture in the heart of Hoi An. Walking around Hoi An town to feel the peaceful air of this city. 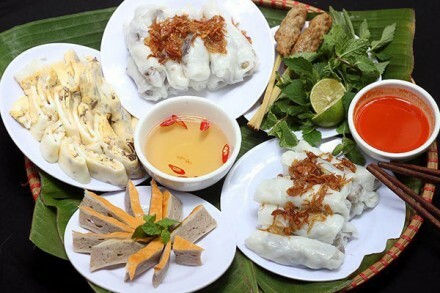 Take a visit to Red Bridge Cooking School and join the cooking class of Hoi An’s and Vietnam’s well-known dishes. Dubbed as the “Pearl of the Far East”, Ho Chi Minh City has long been a cultural, economic and political center of Vietnam. 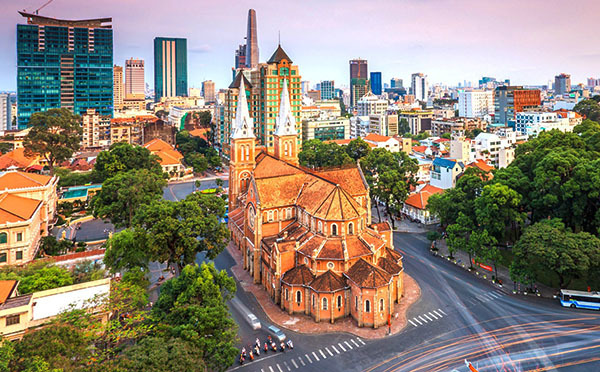 Traveling to Saigon – Ho Chi Minh City more than 300 years old, you can meet the high-rise buildings located close to the sanctuary, amusement park, crowded shopping center, but also lack ancient villas Glass, traditional markets that have existed for hundreds of years. Visit the Reunification Palace, the famous historical witness which passed through the two fierce wars against the French and American colonials. Visit the Central Post Office, one of the oldest buildings in Ho Chi Minh City. It attracts tourists by its typical French colonial characteristics from interior to exterior decoration. Take a look at the Notre Dame Cathedral, which is considered the symbol of this exciting city. Go to Ben Thanh Market: being a bustling market and a social center, Ben Thanh Market is a must-see sight of Ho Chi Minh City. Following, you will leave the hustle Saigon and be heading to My Tho, the closet delta town to Ho Chi Minh city. This city is located in the Mekong Delta region of South Vietnam, where the boat rides on the river are so popular with tourists. Visit Vinh Trang Pagoda, the most beautiful and ancient pagoda in Mekong Delta. Stop at Ankhanh Canal & Mrs. Ut Phím’s house and taste the coconut candy – special products of Ben Tre province. Siem Reap is the capital city of Siem Reap Province in northwestern Cambodia. It is a popular resort town and a gateway to the Angkor region. Nowadays, this city becomes a popular tourist destination. 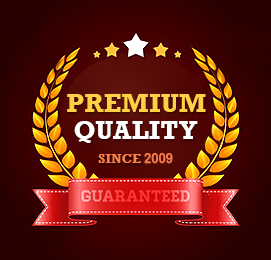 You can easily find a large number of hotels, restaurants, resorts, and businesses here. 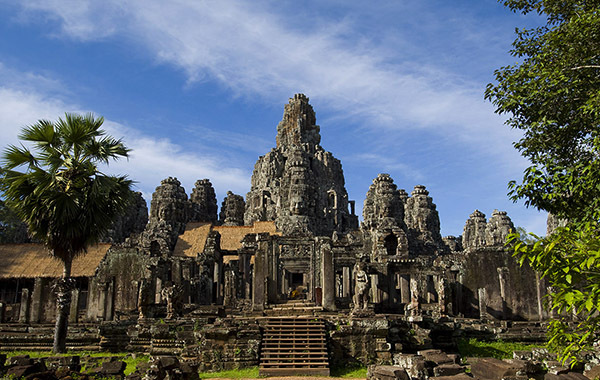 Visit the largest as well as the complete temple of Angkor Wat. 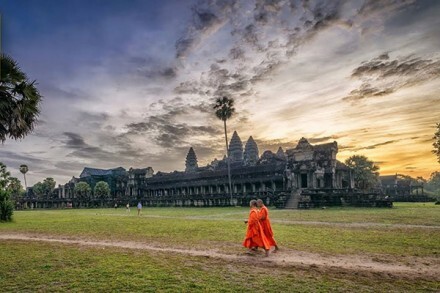 Visit the largest temple of Angkor Wat. This architectural masterpiece covers an area of about 210 hectares and dating in the 12th century. Come to the fortified city of Angkor Thom. Continue to Psar Chars or the “Old Market”, one of the city’s lively open markets, where everything is for sale! Visit Wat Bo, a large temple founded in the 18th century. This temple is respected by local people. The Wat Bo’s Vihear contains unique Reamker murals that are thought to date back to the late 19th century. 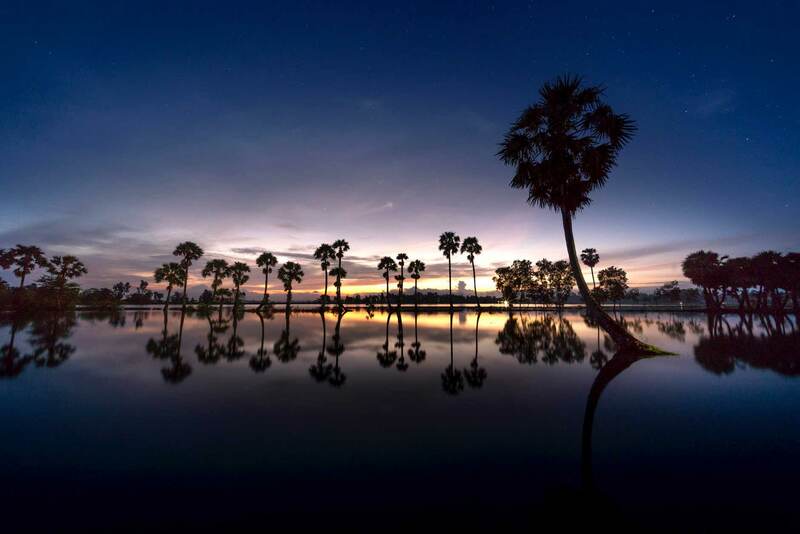 Visit biggest freshwater lake in Southeast Asia, Tonlé Sap, where you will have the opportunity to learn about life on the river. 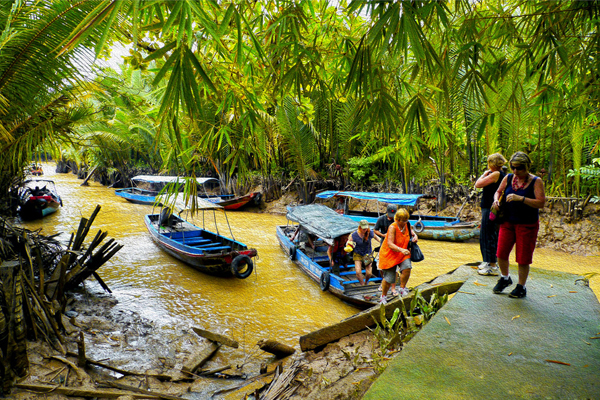 Take a local boat and visit the charming village of Chong Khneas located 10 kilometers south of Siem Reap. Your Indochina itinerary is coming to the end. During the journey, do not forget to take photos and buy specialties, souvenirs to commemorate this memorable trip.